In the last 10 years or so and in light of this increasing demand, Sleipner Motor has further developed its strategy in supplying the commercial markets with ever more powerful hydraulic and AC motor driven thrusters. Bearing in mind, we already have a worldwide distributor network in place to service our customers, it seemed only right that as an engineering led company, we should continue to bring new technology and new product innovation to the market. 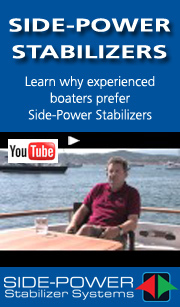 In addition to our traditional hydraulic steering systems and electro-hydraulic power steering systems, which, for the last 25 years or so, we have been making for use within our own domestic marine and commercial markets, Side-Power has also developed a superyacht-specific steering system for the wider international market.